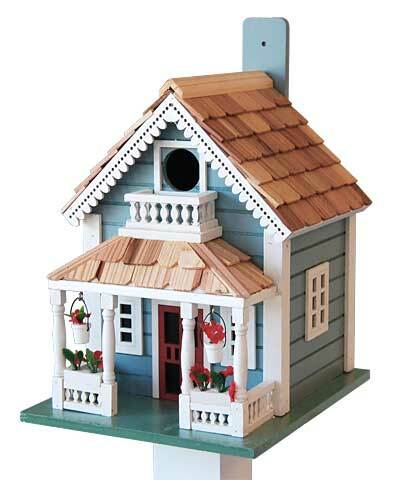 Offer birds an ornate and beautiful roosting spot by placing this Home Bazaar Orleans Cottage Bird House in your yard. The wealth of striking details and colors on this piece brings a luxurious hint to your garden, delighting any visitors to it. A steeply pitched roof, covered in wooden shingles, lends architectural realism to this shelter, enhanced by the soft blue hue of the home. White accents around each door, on the porch, and on the gingerbread trim further ornament the piece, and faux flowers in hanging baskets and porch planters complete the unit. A 1.25" diameter entry hole sits above the portico, allowing small birds passage into the chamber, and a balcony here provides perching for your feathered friends. The tall shape helps the home remain ventilated, and two drainage holes on the base keep the nest dry. Screening forms a ladder, helping nestlings reach the entry hole, and the back panel removes in moments for nest checks and cleaning. A back mounting paddle with predrilled hole allows you to place this shelter against a wall, tree, or fence in moments, or its base rests on a level surface for a different look. The classic, wood construction forms a fantastic home, and the varied colors are sure to add style to your setting. Provide shelter to beautiful birds in your backyard sanctuary with this Orleans Cottage Bird House.